Leonard Wells Volk is one of the most famous American Sculptor. Leonard Wells Volk was born on 7th November 1828, famously known for his master work in his life. Leonard Wells Volk is one of the sculptors who made the life mask of the President of United States of America, Abraham Lincoln. In the year 1867, Leonard Wells Volk helped to establish the famously known ‘Chicago Academy of Design’. Leonard Wells Volk was also elected to serve as the President of the Chicago Academy of Design, till the year 1878. Leonard Wells Volk made many large and monumental sculptures all through his life. Amongst them all, two very famous monumental sculptures are the statues resembling the figures of the American Civil War and also the tomb of the famous politician, Stephen A Douglas. Garrett Volk and Elizabeth Volk gave birth to the famous Leonard Wells Volk at Wellstown (now popularly known as Wells) located in Hamilton Country inside New York. Garrett Volk, his father was into the occupation of a marble cutter. This is the same way in which Volk started his career with his father, after the entire family of Leonard Wells Volk moved to Pittsfield in Massachusetts. Before the year 1855, Volk got married to Emily Clarissa King Barlow, the daughter of Dr Jonathan King Barlow and Honor Douglas. The nationally known politician, Stephen A Douglas represented the Democratic Party and was the maternal cousin of Leonard Wells Volk’s married wife, Emily Clarissa King Barlow. In 1860, Stephen A Douglas, from the Democratic Party was up against Abraham Lincoln who was from the Republic Party as the nominee to become the president of United States of America. 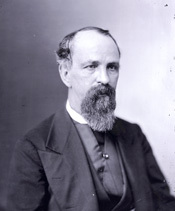 Leonard Wells Volk made sculptures of both, Abraham Lincoln as well as Stephen A Douglas. Leonard Wells Volk moved to the West in the year 1848 and built a studio for the artists in St Louis, Missouri. Stephen A Douglas, the cousin of Leonard Wells Volk’s wife, Emily Clarissa King Barlow, helped the family of Leonard Wells Volk a lot from the year 1855 to the year 1857, when Leonard Wells Volk along with his family moved and travelled to Rome, in order to pursue his further studies. In the year 1857, he moved back to the United States of America with his family and settled in Chicago. Here in Chicago, Volk helped a lot in establishing the precursor, to the ‘School of the Art Institute of Chicago’, which was the famous ‘Chicago Academy of Design’. For 8 long years from 1857, that is, till 1865, Leonard Wells Volk was serving the Chicago Academy of Design as the Director and teacher. He taught numerous students in the Chicago Academy of Design. One of the students of Leonard Wells Volk, was the famous Elbridge Ayer Burbank. In his career, Elbridge Ayer Burbank was noted for about 1200 portraits and more of the Native Americans. In the year 1860, Leonard Wells Volk made one of his best sculptors in his entire career, the sculptor of Abraham Lincoln, one of the former presidents of United States of America. This is one of the only two sculptors of Abraham Lincoln in the entire world. The second sculptor of Abraham Lincoln, was made in the year 1865 by another maker of sculptures, Clark Mills. During the spring in the early 1860, Volk asked Abraham Lincoln to sit so that he could make a bust of Abraham Lincoln, when Abraham Lincoln visited Chicago. Leonard Wells Volk first thought of making a life mask of Abraham Lincoln. This process of making a life mask including the drying of wet plaster on the face of Abraham Lincoln, which was then followed by a process of removal, which was skin stretching. Abraham Lincoln found this entire process to be what we say “anything but agreeable”. Later, Abraham Lincoln maintained a good sense of humour and had a pleasing feeling when he saw the final bust of Abraham Lincoln. Abraham Lincoln also named the bust, “The Animal Himself”. 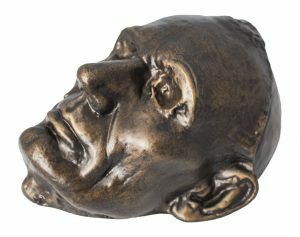 Leonard Wells Volk, later in his career, used this life mask and bust to make other models of Abraham Lincoln, which also includes the full size statue of Abraham Lincoln. The bronze bust of Abraham Lincoln, which was created by Leonard Wells Volk in the year 1860, is now currently present at the El Paso Museum of Art. 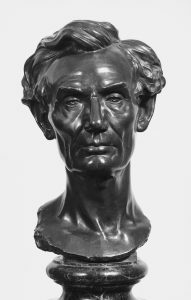 The life mask of Abraham Lincoln which was made by Leonard Wells Volk was later studied by many other artists including Daniel Chester French. During the middle of May in the year 1860, Leonard Wells Volk travelled to Springfield and presented the Lincoln family with the entire cabinet bust which was completed. In the course of such said, he also received the President’s nomination as the Republic Party. In the year 1895, he passed away on 19th of August.